Home / Archive by category "Speech Therapy"
The weather is beginning to change and it’s that time of year when you just want to be outside! Here is a list of fun activities to do with you children to elicit tons of language! 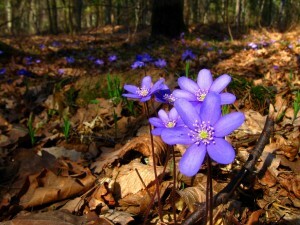 Grab seeds, pots, a shovel, and a some soil to start your plants inside. Grab a kite on a windy day, take it outside and watch it fly! Pack lunch and a blanket and have a picnic outside! Is your Speech Language Pathologist always talking in acronyms and it’s hard to keep up? 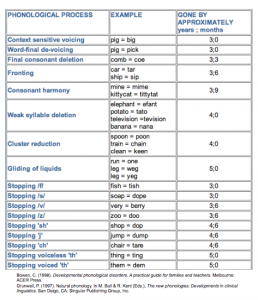 Here is a list of the most common acronyms that most SLPs use. Feel free to comment more acronyms that you have come across! According to the American Speech-Language-Hearing Association, “Speech-language pathologists (SLPs) work to prevent, assess, diagnose, and treat speech, language, social communication, cognitive-communication, and swallowing disorders in children and adults.” So…. What does that mean?! 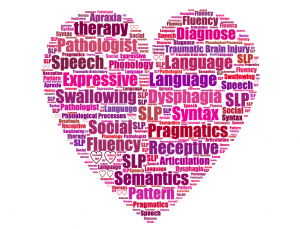 A Speech Language Pathologist (SLP) has a very broad scope of practice, covering everyone from newborns to the elderly, who may have difficulties with communicating, cognition, and/or swallowing. SLPs work with people who have language disorders. A person with a language disorder may have trouble expressing themselves (expressive) or understanding what others are trying to communicate to them (receptive). They may have difficulties sharing their ideas, thoughts, and/or feelings. They may struggle with their grammar (syntax), their meaning (semantics), or their social interactions (pragmatics), both expressively and receptively. SLPs work with people who have speech disorders. A person with a speech disorder may have trouble correctly producing certain sounds (articulation), certain patterns of speech (phonology), or fluency of speech (fluency/stuttering). Articulation – distorting, substituting, or omitting, one or multiple letters while speaking, making it difficult for people to understand. See the chart below to know what sounds should be mastered by what age. 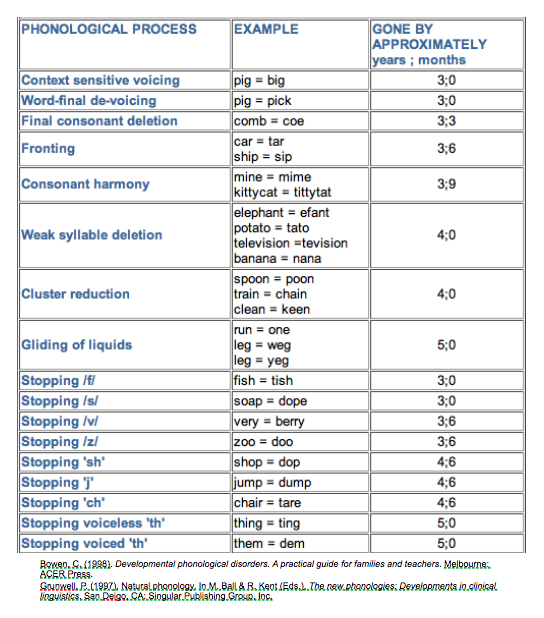 Phonological – continuing to use a phonological process (sound pattern) after the age that it is considered mastered. 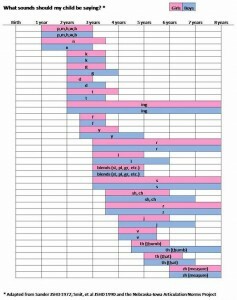 See the chart below of phonological process and what age they should be mastered by. Fluency/Stuttering – an interruption in the flow of speech characterized by repetitions (repeating a sound, syllable, word, or phrase), sound prolongations (elongating a sound or word), blocking (unable to get the word out), interjections (like “um” or “err”), or constantly revising one’s own speech. SLPs work with people who have previously had a Traumatic Brain Injury (TBI) or stroke. A person with a TBI or stroke may have trouble in all areas of speech, swallowing and cognition. SLPs work with people who have trouble eating or swallowing. Sometimes there is an issue with the texture or consistency of the food and sometimes there is difficulties with the overall swallowing process known as dysphagia. SLPs work with their clients to help treat, overcome, and adapt to these problems. SLPs have a wide scope of practice and most specialize in certain areas, but all are capable of diagnosing and providing therapy in any of these subcategories. Have more questions? Leave them in the comments section and we will do our best to answer them!